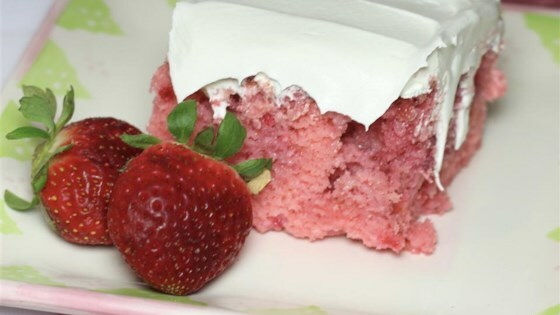 "This strawberry cake is really sweet but oh-so-good! Make it at least 2 days in advance. It gets moister the longer it sits." Mix strawberry cake mix, water, eggs, and oil together in a bowl using an electric mixer on low speed. Increase speed to medium and mix batter for 2 minutes. Pour batter into the prepared baking dish. Bake in the preheated oven until a toothpick inserted in the middle of the cake comes out clean, 24 to 27 minutes. Poke holes all over the cake using the handle of a wooden spoon. Pour sweetened condensed milk over cake, letting it seep into the holes. Cool cake to room temperature, about 30 minutes. Pour thawed strawberries over cake, letting juices seep into the holes. Cover cake with whipped topping. Refrigerate. Really easy and really good. I did not change a thing! I have made this several times. I did change it by using a chocolate cake mix, and it is now my daughter’s and granddaughter’s favorite birthday cake. I used strawberry cake and a white cake for contrast (swirled) and I poked with a straw. No changes. Will definitely make it again.